Canadians tweeted words such as "great," "amazing" and "beautiful." Americans, by contrast, commonly used negative words such as "hate," "hell," "tired," "hurt" and "annoying." It turns out that the stereotype is true. Canadians are more polite than Americans — at least on Twitter. 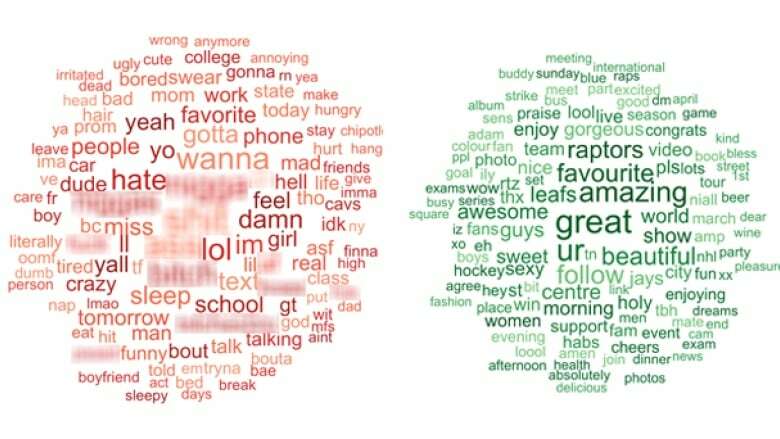 While the two neighbours are culturally similar, a new study from McMaster University shows that Canadian tweeters use more positive phrases such as "great," "amazing" and "beautiful." Americans, by contrast, commonly used negative words such as "hate," "hell," "tired," "hurt" and "annoying." The project is the work of Daniel Schmidtke and Bryor Snefjella, two PhD candidates in the department of linguistics. They work in a lab that looks at how the internet can help us understand our global neighbours. The pair compiled more than three million geo-tagged tweets from February to October last year. As soon as they created a word cloud of the findings, they noticed something interesting. "What's striking is there's a huge difference in the way Canadians and Americans use language," said Schmidtke. "It's a window into their own ideas and beliefs. Canadians seem a lot more buoyant and upbeat and positive." The pair also analyzed tweets from England and Scotland and found subtler differences. English tweeters used the word "small," for example, while Scottish tweeters used "wee." As far as they know, they're the first linguists to compare tweets from two English-speaking countries. Twitter is a good tool for exploring people's attitudes, Schmidtke said. And he casts no judgment over our American neighbours. "I'm British, so I'm impartial to all of this." The pair created a map and word cloud to present their findings. They work under the direction of Victor Kuperman, a McMaster linguistics professor, and are currently writing up their findings to send out for publication.